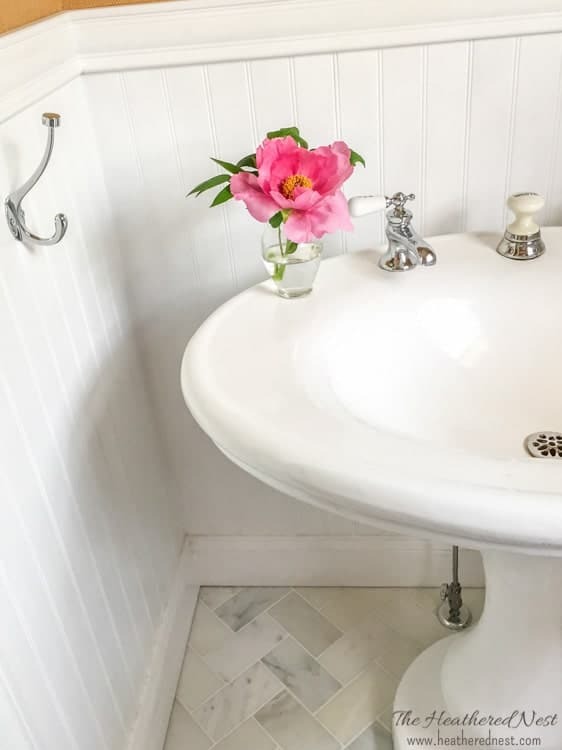 Bathroom design, powder room design…they are some of our favorite things. You know what’s NOT one of our favorite things? Purple. They say purple is the color of royalty. 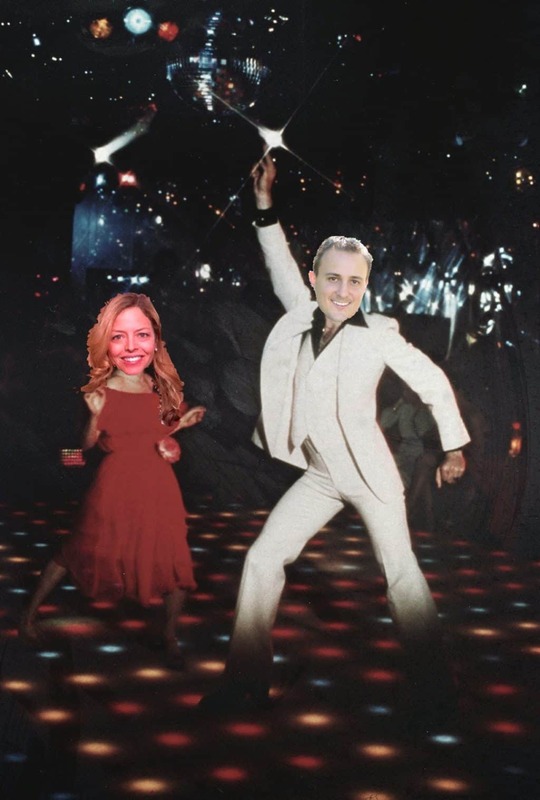 And Lorde may have said it best…”we’ll never be royals.” Good jam, right? 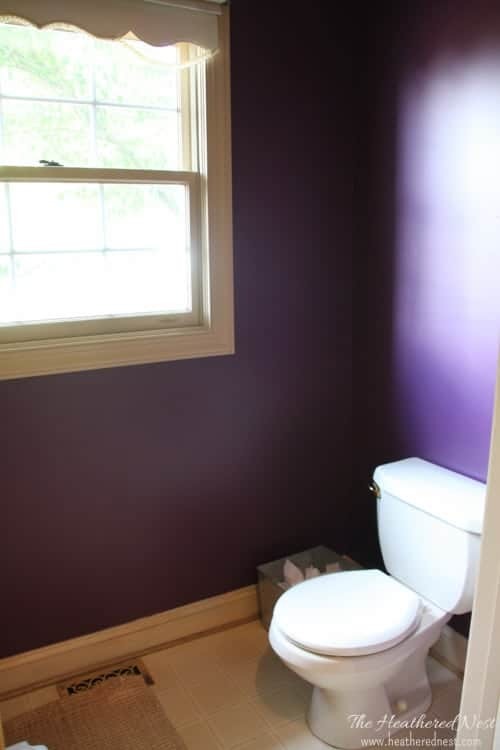 Complete with broken vinyl roller shade, and luxurious linoleum, anyone who thought this lavender loo was staying “as is” was STRAIGHT trippin. 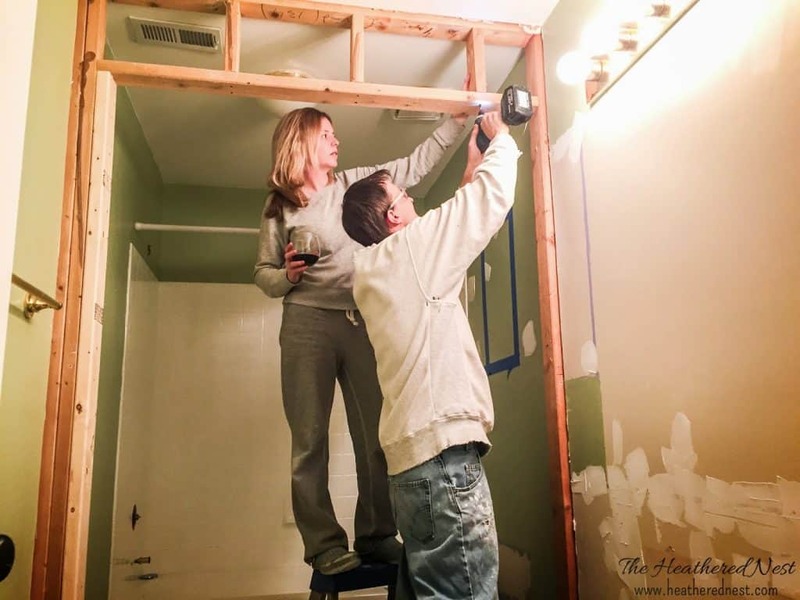 Powder room design and renovation process…here goes! 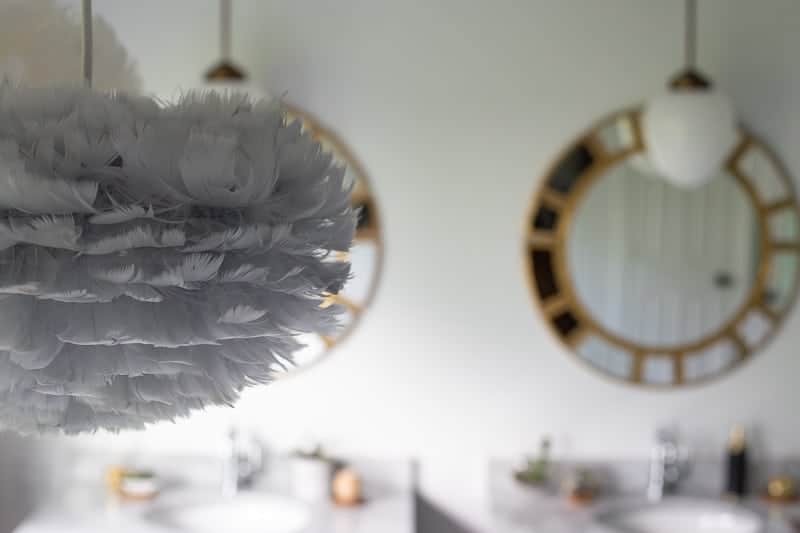 So after just two weeks living in our new pad, I decided on a new powder room design, and I started ripping the old one apart. As Lorde said “we crave a different kind of buzz”…well, this was mine. 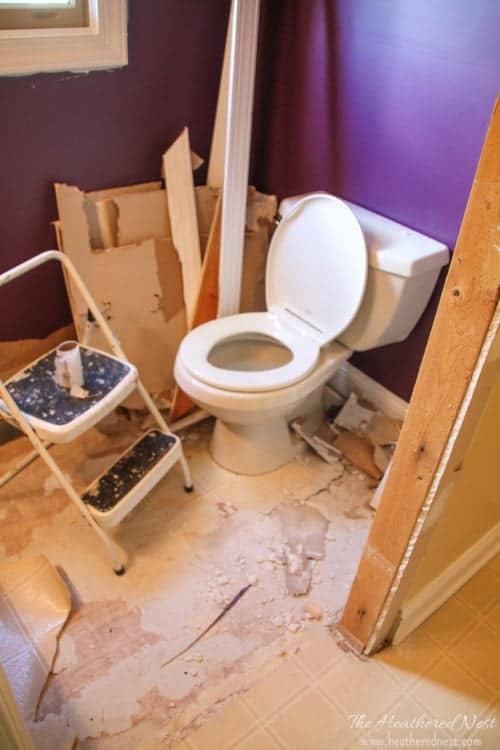 Destruction of the purple-people-eating-privy! Ahhh, the sweet sights of progress! 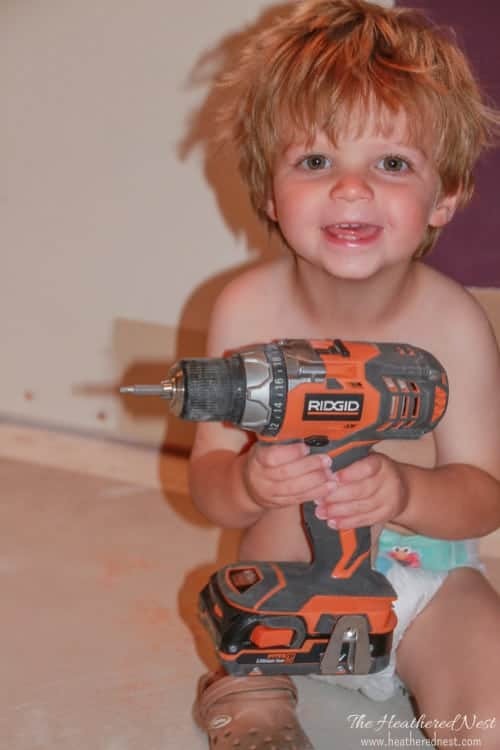 In our home, that’s seeing something like seeing a new powder room design take shape, and getting the child labor force going on installing cement board. A love of k is engrained at a very young age here. 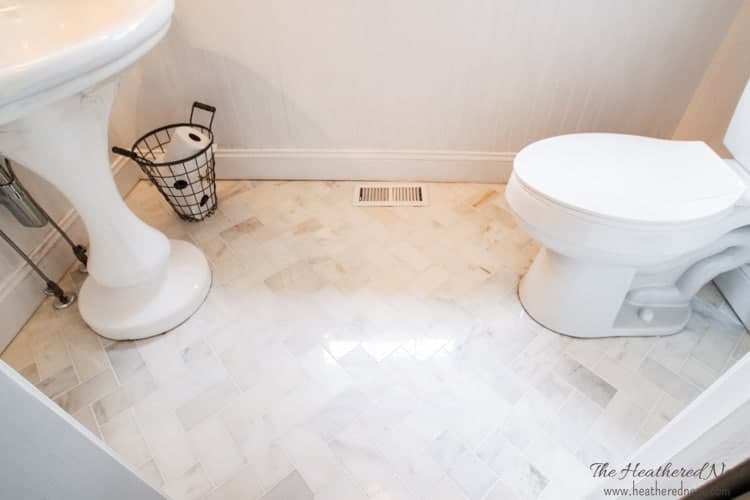 Down go the Carrara marble subway tiles. 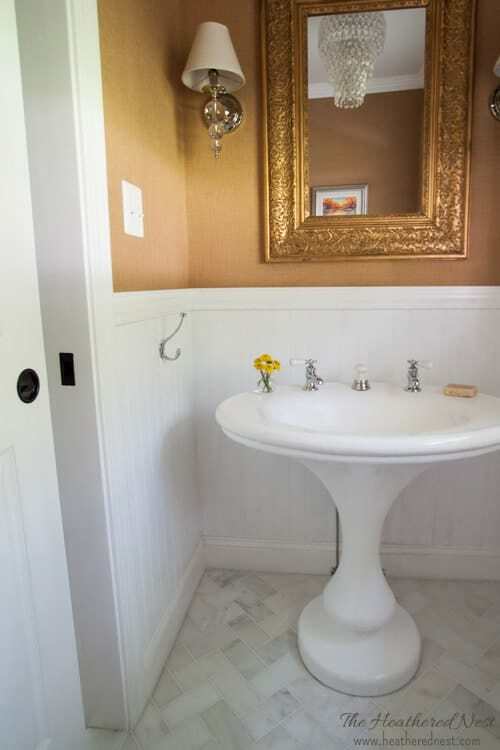 The powder room design really took off once I found the pedestal sink. 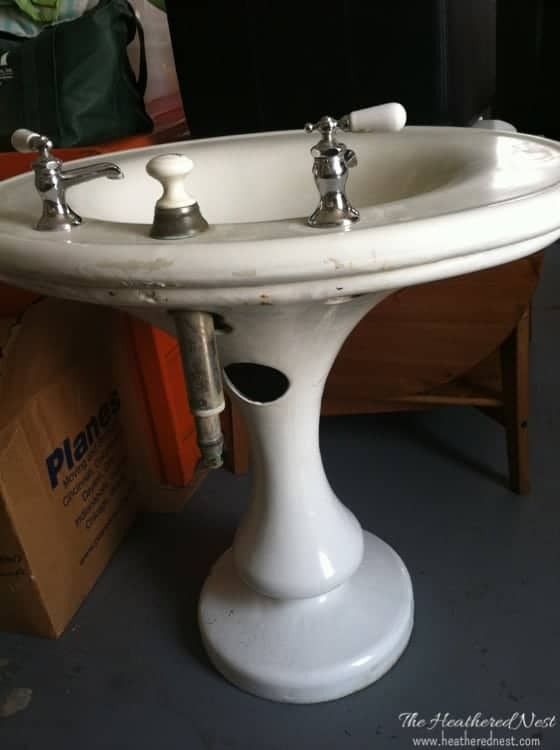 For weeks, I’d been scouring Craigslist for a vintage pedestal, and when I saw this one, I knew I had a winner. 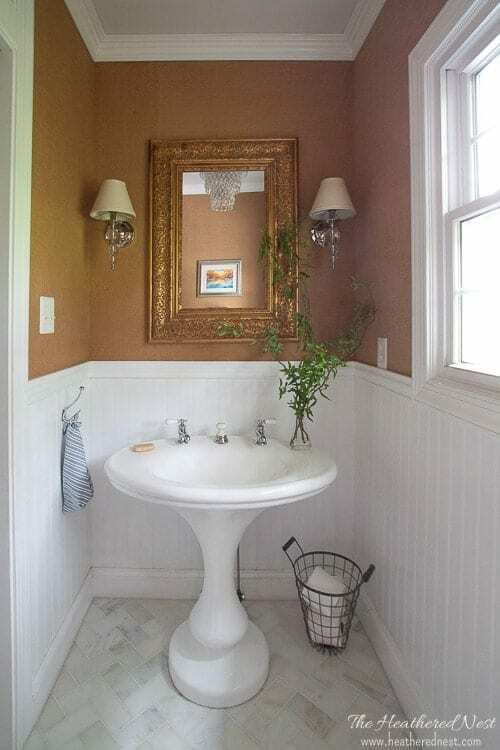 This baby is a 1930’s-1940’s cast iron sink. It was absolutely stunning. Had a bit of rust, and needed to be re-plumbed, but for $80, I think I got a GREAT deal. My father came along with me to pick it up…he wasn’t so impressed, to put it mildly. Sure, it had issues, but that’s universal, right? And, afterall, we aren’t royals…we can deal with a little rust. OK, so maybe more than a little rust. 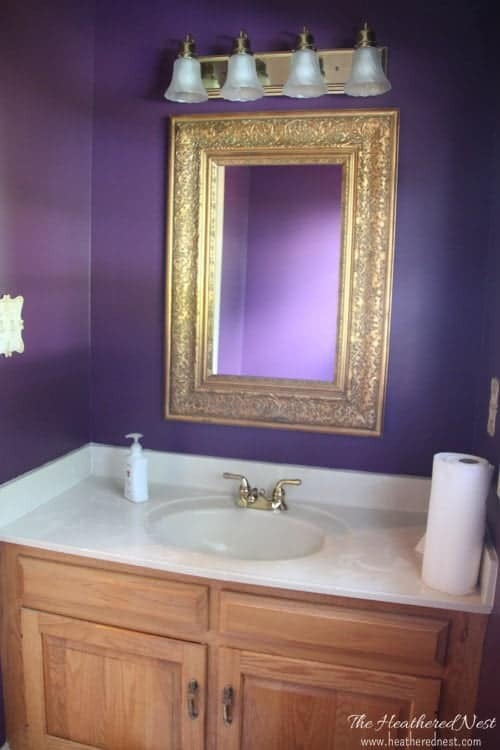 We had the sink professionally refinished. 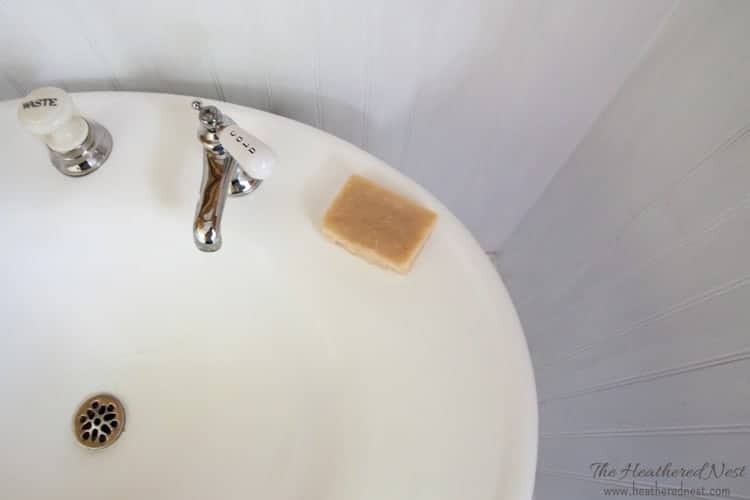 Set us back about $200, which, when all was said and done, was about what we would have paid for a new sink. And in my opinion, this one was just so much cooler. 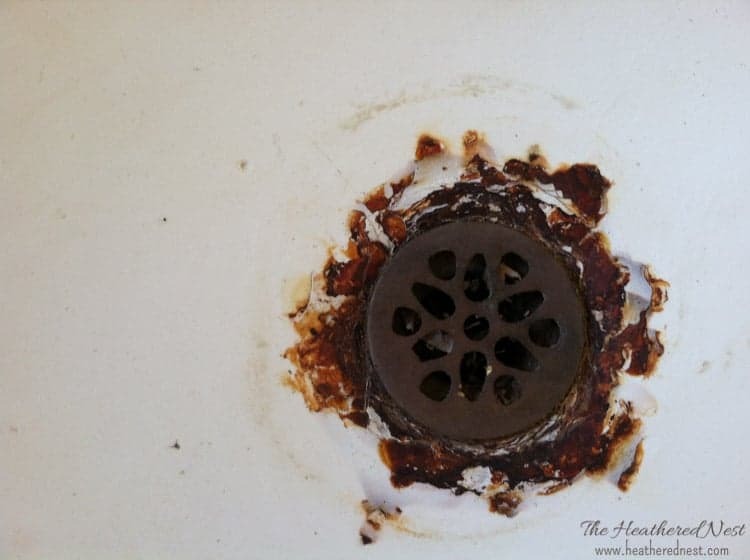 Now, there is no more rust, and we were even able to save the original faucet and “waste” stopper. 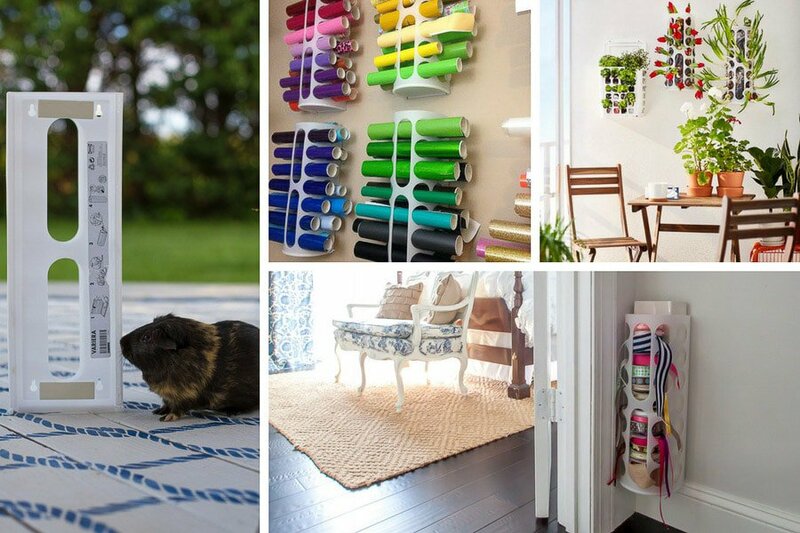 The walls are done in a burlap grasscloth. We used the leftovers we had saved from our family room in the last house. 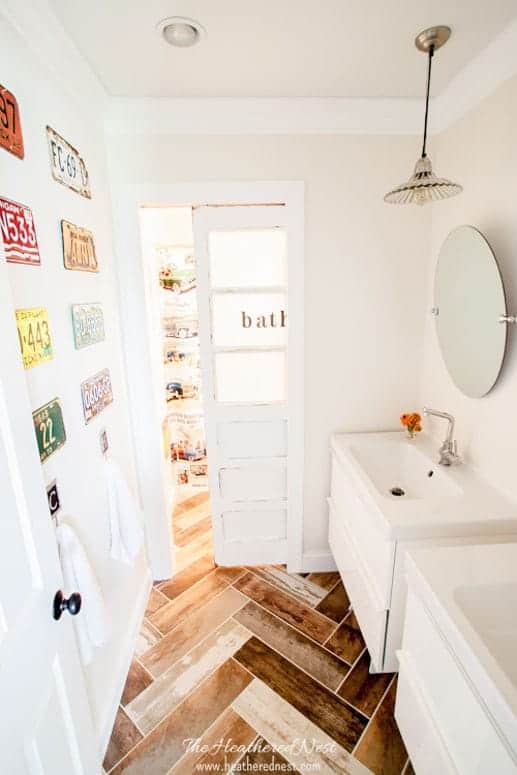 which we laid in a herringbone pattern. 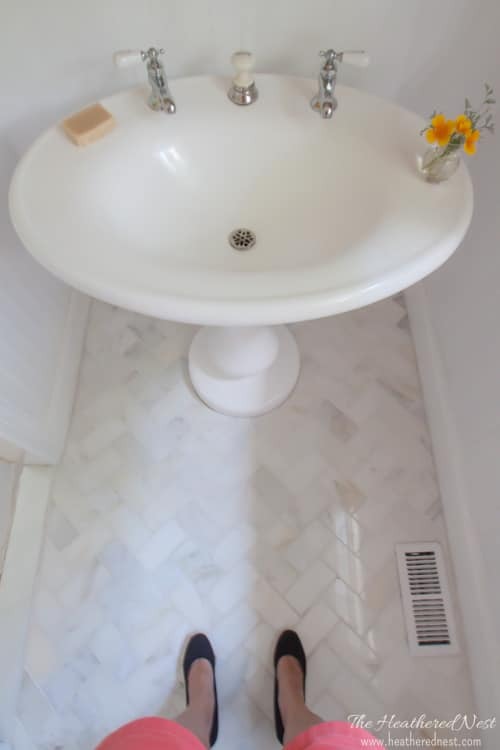 Not the easiest DIY tile installation, but once you get the pattern down, it’s not so bad. 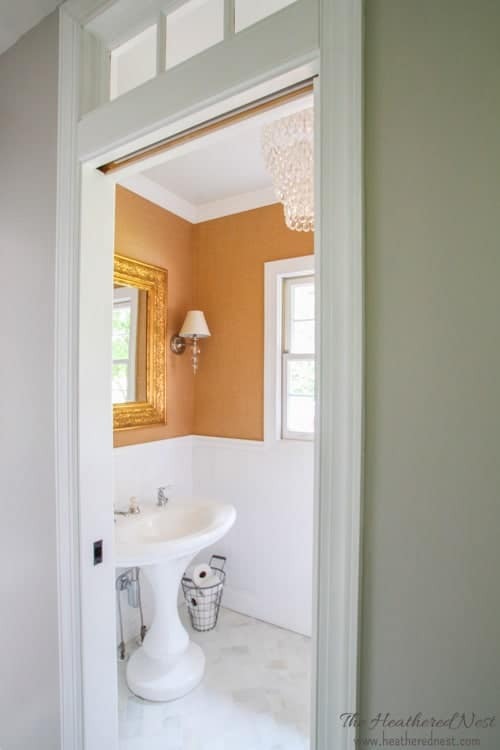 The powder room is situated in a hallway that did not offer much in the way of natural light. And in a ten foot distance, there were FOUR swinging doors, which in a house with three kids was recipe for a lot of noggin bumps and bruises. we took out the old door, and added a pocket doorand transom window. 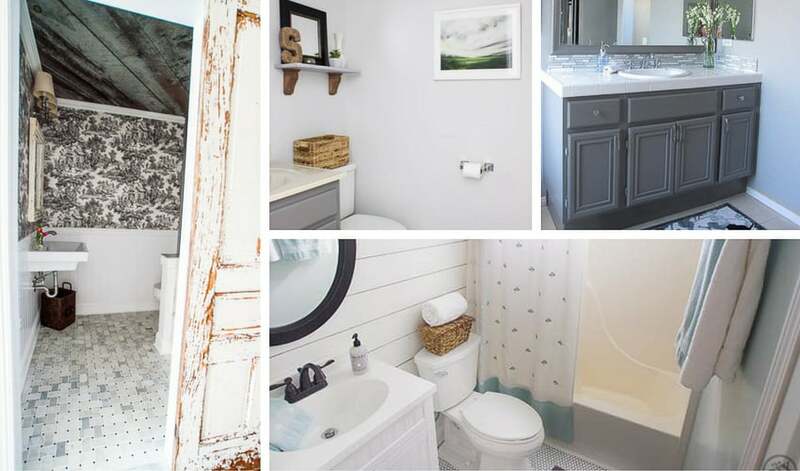 These changes made a big difference in the bathroom, as well as the hallway. Beadboardwas added around the perimeter of the room, and of course, because of my ongoing chandelier fettish, the room got one of those as well as a couple pretty sconces. as well as Cottages & Bungalows and This Old Housemagazines! 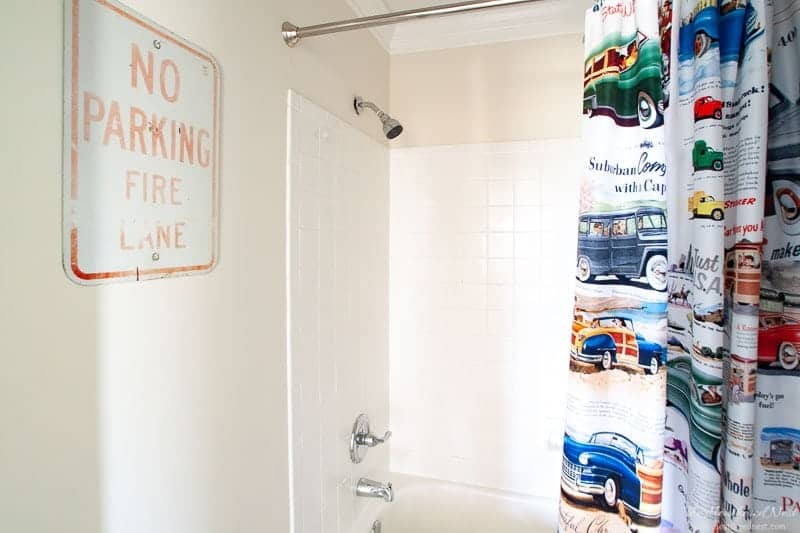 And now our wash-room work-over is complete. 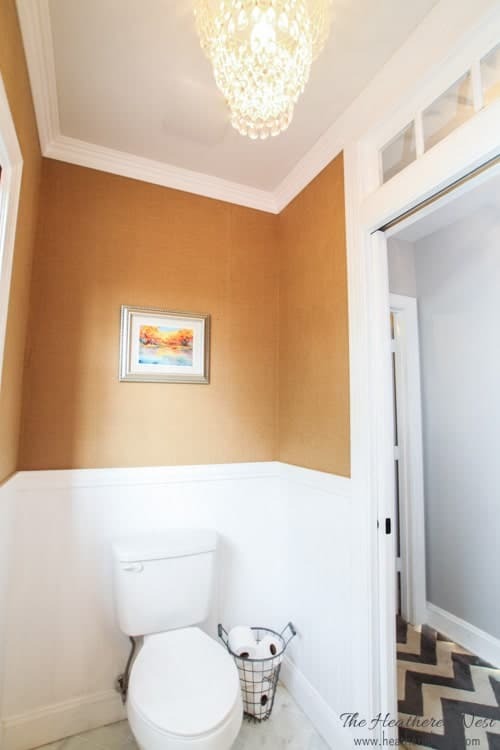 So, come on over Lorde…promise you won’t be trippin in this bathroom now. We’re just stylin’ and profilin’ up in here. 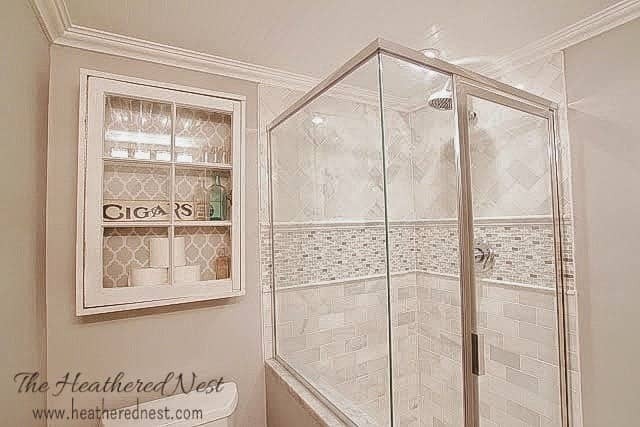 Portfolio with an id of "bathrooms_portfolio" is not defined. 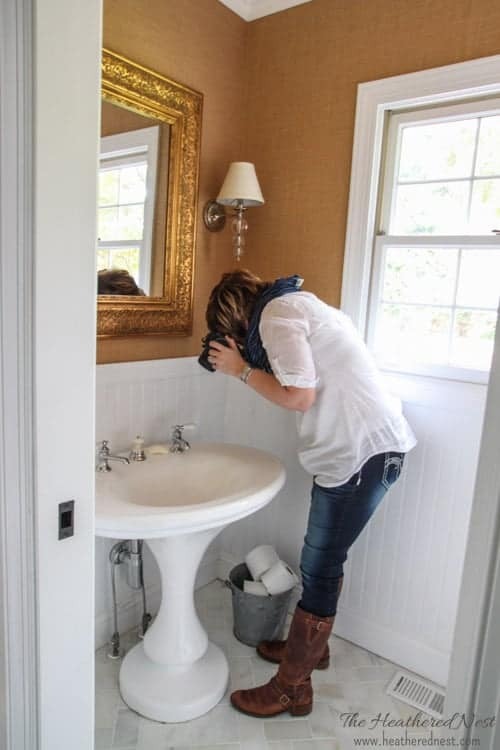 I love this powder room! I’m in the process of updating ours in a similar way. 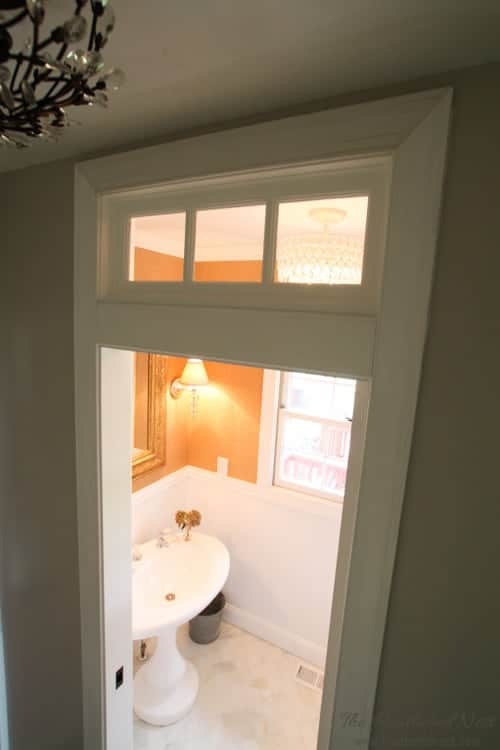 I am having the hardest time finding a suitable transom window. 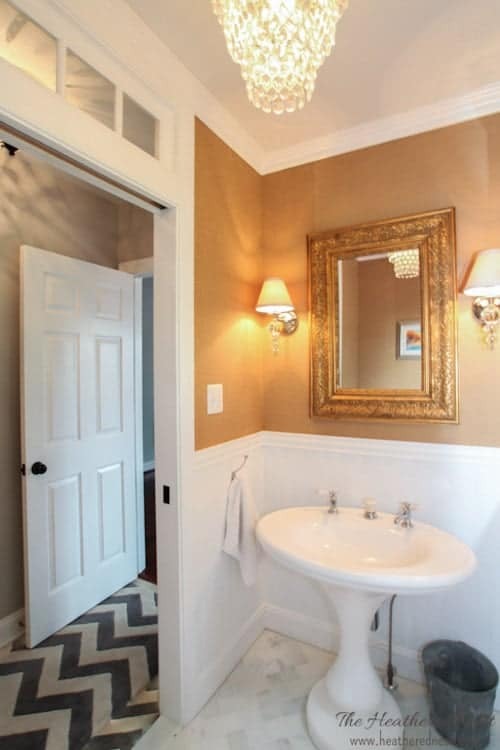 Where did you get this one and what are the dimensions of it and the pocket door you have here? Thanks! Hmmmm…we got it online at a place that only sells transoms I believe. I will try to find an invoice so I can give you more details on that and the pocket door Selena!